mouse medicine: new year's day! In the New Year, may your right hand always be stretched out in friendship, but never in want. new year's greetings to everyone out there in mouseland! lots on tap for today, but couldn't let the day pass without wishing everyone in the bloggyhood a HAPPY NEW YEAR! I look forward to making the rounds over the weekend! photo: the mouse's holiday mice (thanks annie!) - aren't they the absolute cutest!! I think it is always good to start the new year with a listen to tommy's story of mouseland for a wee bit of inspiration. A new healthy, empowering, passionate year. A year of being heart coherent and heart happy. That mousie picture is just adorable. Those mice are darling. Have a great 2010! Actually, except for Bono the hairdos haven't changed that much. Adam's and Larry's are just a little shorter, and who knows what The Edge's hair looks like, since he's always wearing a hat. But yeah, losing the disco mullet was the best thing Bono ever did! Happy New Year! Those are delightful mice. Haha love the mullet! Happy New Year Kim. Thanks for the help with the larger photos on the blog and the inspiration to carry a camera. I still aspire to take shots like yours! 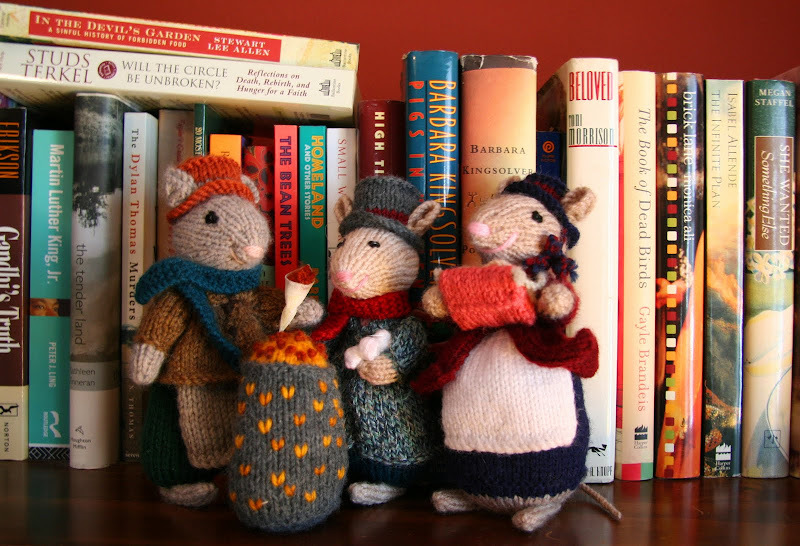 Love the knitted mice! You did those, right? Will ignore the vid, as I'm streaming polka music at the moment :) Happy new Year kimy and best of everything to come, in the new decade! is anyone else in shock that it is 2010! and doesn't it sound like a date from a science fiction film! that must explain my the problems I've had for the last few years with the whole time-space continuum, we are living in the future! baino - you are very welcome with the photo size. but let me assure you, your photos are fantastic - you have a wonderfully eye! subby - I did NOT make the mice. I wish I could but I'm not talented in that department. the story on the mice is they were a gift from my sister annie. she sent me one one year and two more the following year. she found them at a holiday craft show being held in lusaka, zambia where she lives. I don't know if she went to the show this year or if the woman who made them is still making holiday themed mice. not to be greedy, but I'm crossing my fingers that she found more this year and that sometime in the not too distant future there will be one or more mice to join this sweet trio - she leaves zambia this summer so this is the last chance. Well I for one, think they're the cutest ;) Thanks for the info! Have a wonderful New Year, my little mousie friend! my those are so cute! Happy 2010 to you dear.